Infortunately I don't have much more good photos at hand, because ever since the Reise Reise era, Kruspe as been turning into a drag queen. ^First you need to have the photo uploaded somewhere, and have its URL. Then when you go to post anything, you press a little button that reseambles a painting of a tree, and insert the image's url in the dialog box that popups up. ^I know. And trust me, I have sayed much harshest things than that. Most of them in a forum that no longer exists. Got it Snake...will try posting photos next week. Going on vacation until Wednesday. Talk to you all then! I tried to post some photos here, but they won't show up. I put the url's from imageshack. Any advice? ^Where did you post them? I uploaded them to imageshack then I try to post them here by clicking the 'Insert image' button and then copied the picture's url to that. Nothing still shows up. ^When you upload images to imageshack, it also generates the proper code to use in message boards. You don't need to click the button here; you just copy/paste the "forum code" that it automatically provides. Thanks Snake! Here are a few pics taken by myself at the concerts in Finland 2010. I got a lot more pics of Richard taken from the Internet and by myself, I might post some of them here later also! 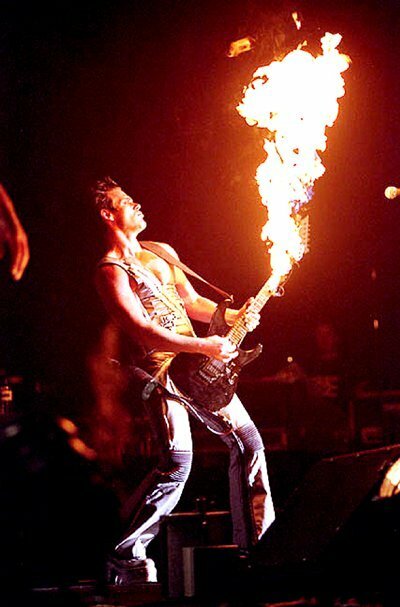 This is one of the most epic pics ever taken from a guitarist. Mich verfolgt meine eigene scheisse! I don't like very much either that Emigrate photoshoot, but a drag queen? C'mon! At least he doesn't wear lipstick anymore like he did in the Reise, Reise tour.